380 mm L/52 SK C/343 х 2 pcs. Initial AP Shell Velocity820 m./s. 105 mm L/65 Dop. L. C/317 х 2 pcs. HE Shell105 mm Spr.Gr. Kz. 150 mm L/55 MPL C/354 х 1 pcs. Initial HE Shell Velocity875 m./s. 150 mm L/55 SK C/284 х 2 pcs. 37 mm Flakzwilling 308 х 2 pcs. 128 mm L/61 SK C/4211 х 2 pcs. HE Shell128 mm Spr.Gr. Kz. 37 mm Flak LM/426 х 2 pcs. 20 mm Flakzwilling 3812 х 2 pcs. A very high-speed battleship that was close to the battle cruiser type. Under the re-armament project, she was equipped with 380 mm guns that enabled her to fight off larger contemporary ships. Among her drawbacks were the small number of main guns and weak horizontal armor. Hailing as the first post-World War I battleship design in the German battleship line at Tier VII, Gneisenau dramatically shifts from the bulky, slow-to-react dreadnoughts that are more dangerous when they get close into a post-dreadnought battleship which can do many of the same things (to a certain degree) while remaining one of the most versatile battleships at her tier. Playing Gneisenau is decidedly different from playing her counterparts at Tier VII. While Gneisenau may appear slender and lightly armored, don't be fooled: she is deceptively durable in the hands of a captain who knows how to handle her. Her 15-inch guns give her the capability of fighting on the same level as her peers, though she does have fewer barrels than the competition. From a handling perspective, she's the fastest battleship out of the German line, and has no trouble keeping up with cruisers as needed. Her speed is arguably Gneisenau’s greatest asset. It allows her to close the gap with enemy battleships and force them into close range where her main battery, secondary guns, and torpedoes can deliver the killing blow. While most battleships tend to join a battle line, Gneisenau can instead join up with fast cruisers and blitz the enemy by appearing quickly from an unexpected location. She is capable of operating solo, but extra caution is needed when doing so; her main battery dispersion is frequently frustrating, making long-range combat decidedly not her strong suit. Gneisenau is most comfortable at medium-to-close range — even point-blank range — where she can make every shell and torpedo count. Gneisenau is unique in the game as the only regular tech tree battleship to have torpedoes available; the only other battleships with torpedo tubes are her premium sister Scharnhorst, the premium version of her successor, Tirpitz, and Japanese premiums Mutsu and Kii. Her rakish looks hide a brutal array of secondary batteries that unload at an impressive rate of fire, and are more than capable of shredding destroyers of equal and lower tiers (higher tier destroyers are likely to have concealment values that make closing with them suicidal). Gneisenau — like Scharnhorst — is a ship that is equally at ease diving into a melee or holding back from one. Learning when to dive in and put her secondaries and torpedoes to work (and when not to) is half the fun of learning how to play her well. LittleWhiteMouse in the Gneisenau from the NA forums. Tested in Update 0.5.9. Highly versatile battleship; her armament allows her to play as a typical battleship, while her speed lets her behave as a battlecruiser at need. Excellent 15-inch guns, same as those on Bismarck and Tirpitz. 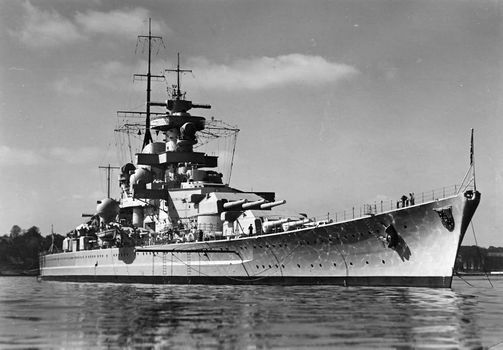 First-rate speed for a battleship (32 knots); the fastest battleship in the German battleship tree. With a Sierra Mike ( ) signal, she is as fast as Tier IX's Iowa. Solid secondary battery guns, comparable to Japanese counterpart Nagato. Good range at her tier. Has one triple-tube torpedo launcher on each side. Outstanding armor belt combined with German turtleback armor scheme makes her deceptively durable. Reasonable concealment rating; with a captain that has Concealment Expert, her surface detection range goes down to an astounding 13.1km (comparable to the equal tier Japanese cruiser Myoko). Good anti-aircraft suite; when fully built for anti-air duties, she is deadly to enemy planes. Short torpedo range of 6km. 15-inch guns have trouble with angled enemy battleships (use HE against the superstructure or choose a different target). She is nearly impossible to citadel, but will take a lot of full penetration damage. AB-X layout of dual mount turrets may feel lacking. Deck armor can potentially be penetrated by bigger guns. Hull (B) is first priority, as it comes with a boatload more hit points and secondary guns (that also contribute to her anti-aircraft defense). The engine module upgrade should be next, with the range upgrade being taken last. Gneisenau doesn't mind brawling at close range; her commander skills and upgrades can be tailored to such tactics, or focused more on anti-aircraft defense to increase her survivability. Gneisenau has access to four Upgrade Slots as a Tier VII ship. Gneisenau also has the option of building for Secondaries or AA. Slot 1: Main Armaments Modification 1 ( ) to improve her main battery survival. Slot 2: Damage Control System Modification 1 ( ) to improve her overall survival in battle. Slot 3: Aiming Systems Modification 1 ( ) to improve her main battery accuracy, or AA Guns Modification 1 ( ) for an AA build, or Secondary Battery Modification 2 ( ) for a secondary build. Slot 4: Damage Control System Modification 2 ( ) to further improve her overall survival. Steering Gears Modification 2 ( ) is also an option to improve her maneuverability. Even if choosing to focus on her secondary battery, Auxiliary Armaments Modification 1 ( ) is not recommended; improving the survivability of Gneisenau’s main battery with Main Armaments Mod 1 is still a better choice. Secondary Battery Build: Priority Target or Preventative Maintenance at Level 1, Adrenaline Rush at Level 2, Superintendent at Level 3, Advanced Firing Training at Level 4. These skills increase Gneisenau’s survivability while buffing her secondary battery range. Subsequent points should be invested in Manual Fire for Secondary Armament and Basic Firing Training. Anti-Aircraft Build: Priority Target or Preventative Maintenance at Level 1, Expert Marksman at Level 2, Superintendent at Level 3, Manual Fire Control for AA Armament at Level 4. Additional points should be put into Advanced Firing Training when available. Gneisenau is a deathtrap for enemy planes in this configuration, dispensing a punishing amount of damage from her 128mm dual-purpose guns. Both Damage Control Party II ( ) and Repair Party II ( ) are recommended for the quicker cooldowns, especially for captains who have opted for the Secondary Battery Build. 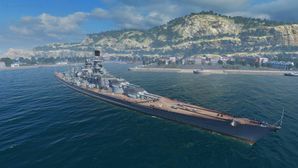 Players who wish to spend doubloons can equip Gneisenau with Type 17 camouflage that lowers her detection radius, reduces the accuracy of incoming shells, reduces her repair costs, and increases the amount of experience she earns. Players who have followed the Secondary Battery Build above will want to equip Mike Yankee Soxisix ( ) and India Delta ( ) signals in order to further boost the effectiveness of their secondaries and Repair Party ( ) consumable, respectively. Players following the Anti-Aircraft Build are encouraged to equip November Echo Setteseven ( ) for the bonus to AA gun damage. Gneisenau at anchor, date and location unknown. With the commissioning of the last Deutschland-class vessel in 1936, the Kriegsmarine found itself in possession of warships that could outrun almost every ship that outgunned them, while being able to outgun almost every ship that could outrun them. The few exceptions to this were the British battlecruisers HMS Renown, HMS Repulse, and HMS Hood, and the Japanese battleships of the Kongo class. The entry of Deutschland and her sister ships into service led the French begin designing a new class of battlecruisers — the Dunkerque class — which would be larger, stronger, and faster. Having learned the intended operational specifications of Dunkerque and her sisters, German designers began development on improved versions of the Deutschland-class, known as Panzerschiff D and Panzerschiff E. Shortly after, however, the French laid down Strasbourg, which was a more heavily-armored Dunkerque and would again outclass the nascent German designs. The Kriegsmarine responded by designing an even more powerful ship, this time with a third turret — to help overcome the difference in firepower between the two classes — a tougher armor scheme, and a stronger propulsion to allow high speeds. This step was — strictly speaking — not entirely legal. The Treaty of Versailles forbade Germany from possessing any warship in excess of 10,000 tons displacement. With the new class being designed for a displacement in excess of 30,000 tons, they were in clear violation of their treaty obligations. Subsequently, Hitler reached out to Great Britain and initiated negotiations of a new Anglo-German Naval Treaty, which partially legitimized the construction of the new ships. Whether the treaty fully covered the legitimacy of the new ships remains topic of discussion even today. The armament of these ships consisted of three triple turrets with 283mm guns, the same caliber as those found on the Deutschland class. However, these guns were modified to increase their performance: the barrel was lengthened, and the weight of the shell increased. Additionally, the reloading and hoist system saw an improvement to allow a faster rate of fire, with reloads of 17 seconds being achieved during trials. Despite these improvements, German command knew that the 283mm guns were not competitive against larger surface units and planned early on to replace these guns with more powerful 380m twin turrets (the same as would later be mounted on the Bismarck class). One of the reasons to not install the turrets from the get-go was to not provoke the ire of their British neighbors, as negotiations with them were ongoing. The secondary armament was a mixed load out of twelve 150mm guns, mounted in four twin and four single mountings, and a dual purpose battery of seven twin 105mm guns. In 1942 — following the usage of these ships as merchant raiders — both Scharnhorst and Gneisenau received two triple torpedo launchers that had been removed from light cruisers Nürnberg and Leipzig. The mid-range anti aircraft armament consisted of eight twin 37mm Flakzwilling 30, which were designed as a weapon against medium bombers; against mono planes, however, these guns would have limited effectiveness. Short range AA was provided by a steadily increasing number of 20mm guns in both single and quad mountings. The propulsion was upgraded from the Deutschlands. Unlike the diesel propulsion of their immediate predecessors, the Scharnhorst class went back to traditional steam propulsion, able to crank out 125,000 shaft horsepower across three shafts; output could be pushed up to over 160,000 in times of great need. This gave the Scharnhorst class a design speed of 31 knots, with the highest noted speed being above 33 knots. A stern catapult would allow them to operate seaplanes for the purposes of scouting. The protection of the Scharnhorst class was drastically improved. The main armor belt was 350mm thick, and behind it followed a 105-110mm strong turtleback, which would deflect shells away from the vitals at short combat ranges. The horizontal protection consisted of a 50mm strong main deck, and the vital areas had an additional 80-95mm strong armored deck. During their service these ships saw several modifications. The most important ones were the addition of an Atlantic bow in 1939 to improve the seaworthiness, the removal of the optical rangefinders of the A-turret in 1941 due to the lenses being constantly coated with water, the aforementioned addition of triple-tube torpedo launchers in 1942, and the continual addition of radar and sensory equipment for the purpose of detecting and engaging opposing vessels. Gneisenau and Scharnhorst operated together for much of the early portion of World War II, including sorties into the Atlantic to raid British merchant shipping. During their first operation, the two ships sank the British auxiliary cruiser HMS Rawalpindi in a short battle. Gneisenau and Scharnhorst participated in Operation Weserübung, the German invasion of Norway. During operations off Norway, the two ships engaged the battlecruiser HMS Renown and sank the aircraft carrier HMS Glorious. Gneisenau was damaged in the action with Renown and later torpedoed by a British submarine, HMS Clyde, off Norway. After a successful raid in the Atlantic in 1941, Gneisenau and her sister put in at Brest, France. The two battleships were the subject of repeated bombing raids by the RAF; Gneisenau was hit several times during the raids, though she was ultimately repaired. In early 1942, the two ships made a daylight dash up the English Channel from occupied France to Germany. After reaching Kiel in early February, the ship went into drydock. On the night of 26 February, the British launched an air attack on the ship; one bomb penetrated her armored deck and exploded in the forward ammunition magazine, causing serious damage and a large number of casualties. The repairs necessitated by the damage were so time consuming that it was determined to rebuild the ship to accommodate the 38 cm guns as originally intended. The 28 cm guns were removed and used as shore batteries. In 1943, Hitler ordered the cessation of conversion work, and on 27 March 1945, she was sunk as a blockship in Gotenhafen (Gdynia) in German-occupied Poland. She was eventually broken up for scrap in 1951. Gneisenau’s original 283mm main battery guns are not available in-game. See Scharnhorst for the historical version. Hull (A) represents Gneisenau’s planned configuration after refitting with 38.0 cm SK C/34 main guns; these are the same 15-inch guns found on both Bismarck and Tirpitz. She and her sister Scharnhorst were to be fitted with them historically, but this upgrade never actually occurred. However, the tripod mast that had been constructed and planned to be fitted to Gneisenau aft of the hangar during her major refit is not present. This mast would take the same position as it does on Scharnhorst. Her historical secondary battery has been replaced by a hypothetical set of 12.8 cm KM40 guns on Hull (B). The tripod mast is still missing from this upgrade. Stock propulsion is fictitious. There was no 125,000 shaft horsepower downgrade. None of Gneisenau’s historical paint schemes are currently available.. The wappen (coat of arms) of Gneisenau. Gneisenau fitting out at Kiel, 1937. Gneisenau during gun trials off Rugen Island in the Baltic Sea, summer 1938. Gneisenau anchored at Kiel, May 1939. Gneisenau anchored at Kiel, June 1939. Gneisenau refueling off the Portugese coast, July 1939. Gneisenau at sea, circa 1939. Großadmiral Erich Raeder visiting Gneisenau in 1941 while she is inside the Laninon drydock number 9 in Brest, France. Gneisenau as she appeared in February 1942. Aerial reconnaissance photo of Gneisenau in dry dock, March 1942. Gneisenau’s 283mm turret "Caesar" on display at Austrått Fort, Norway. An SK C/28 150mm turret mounted as a shore battery. This type of turret was installed aboard Gneisenau. The interior of an SK C/28 150mm turret, similar to one of those installed aboard Gneisenau. This page was last modified on 19 February 2019, at 09:49. This page has been accessed 143,443 times.